It's still 2014, better known as The Year Of The Great Lime Shortage. Oh, there's plenty of lemons around. Sure. I get it. Lemons. OK, lemon-lover, but tell me how good Sprite, America's Favorite Lemon-Lime soda pop, would taste without the lime. Tell me where Key Lime Pie, Chipotle's chips, and Margarita Mondays would be without their star ingredients. I'm asking you to think about the importance of lime in your life, because the situation is dire. The Great Lime Shortage of 2014 is dragging ever onwards, and bartenders — specifically, the hands of bartenders — are bearing the brunt of the burden right now. In fact, Peter Kohtz, the owner of a trendy Los Angeles restaurant known for its cocktails, told the Associated Press that his limes now cost between $80 and $130 for a case of 200, up from $15 a year ago. That's inevitably led to some awkward staff meetings at Kohtz's restaurant, Luna Park. I tell the bartenders, "Squeeze those limes extra hard. Squeeze out every drop you can." Also being squeezed are plane travelers, and we don't just mean the bulk of us sitting in cattle class (HA!). Alaska Airlines stopped serving limes on its flights in March "due to skyrocketing lime prices," according to a spokeswoman. And United started subbing lemons for limes in some cases. Lemons are yellow. Limes are green. Lemons are bigger. Limes are smaller. Lemons are sour. Limes are bittersweet. Lemons have more Vitamin C. Limes have more Vitamin A and calcium. Lemons are good in lemon bars, lemonade, and sometimes homemade salad dressings. Limes are good in everything else. ^ A drink no one wants. 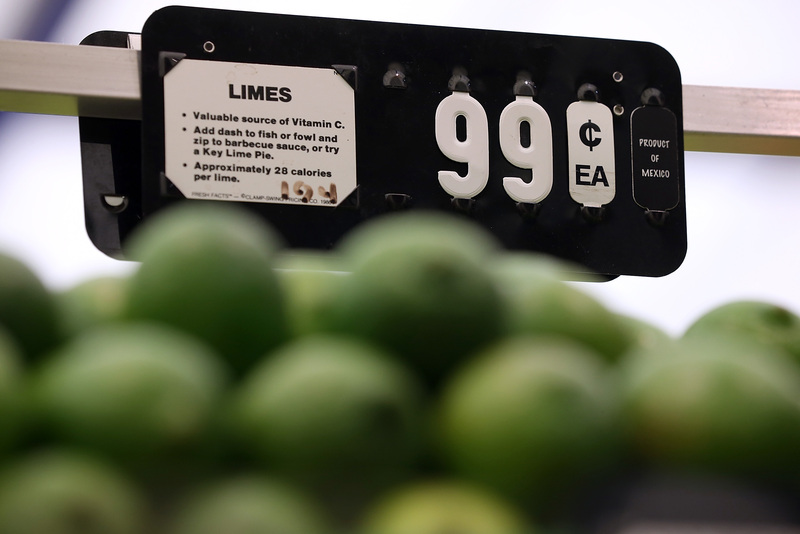 Who's to blame for the lime shortage? It turns out to be a perfect storm of tree disease, actual storms, and Mexican drug cartels. (Or a conspiracy advanced by the all-powerful lemon lobby.) Americans used to eat way fewer limes than we do now, according to citrus researcher David Karp. Then we saw the light, increased our guacamole consumption, and started planting lime groves. Cheap competition from Mexico ensued, reducing the incentive for America to produce the crop. Cue disaster. America's lime crops were decimated by Hurricane Andrew, which flattened 4,400 acres of globular green fruit in 2000. Then the scourge of citrus canker disease led Florida to basically burn most of its remaining lime crops. And now Mexican drug cartels are driving up already-strained lime prices by holding up shipments and ordering drivers to pay a fine to continue with their delivery unharmed. And that, America, is why we're in thrall to a lime shortage. Remember to tip your bartender.